Hi Girls, How are you all? I've had a pretty busy week celebrating my birthday and then doing uni work for my assignment deadlines - final year is such a killer! 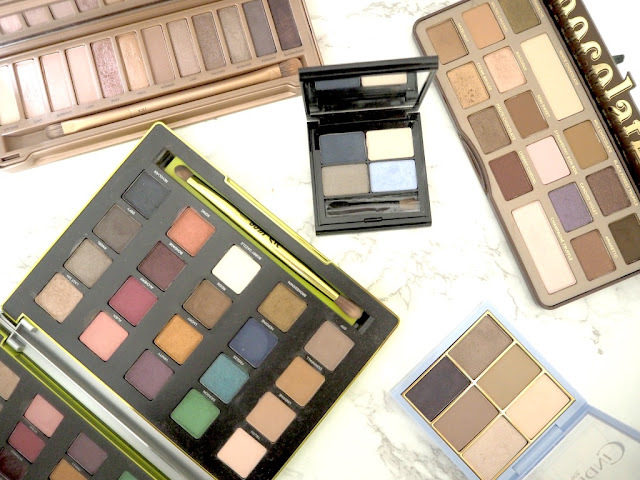 I have some great blog posts planned from some of the lovely gifts I received for my birthday, but today I want to bring to you some of my favourite eyeshadow palettes. 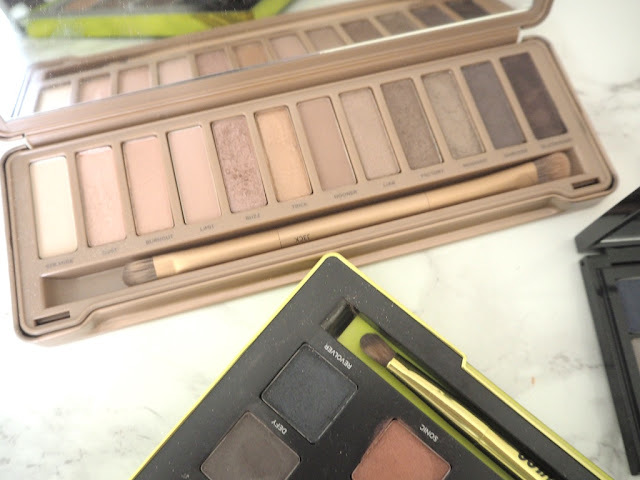 Urban Decay - Naked 3 | I'm a massive fan of the Urban Decay Naked palettes and they are probably my most used out of all the palettes I own. I own all 3 of the Naked palettes but number 3 has to be my favourite for the amazing selection of soft pinks, rose golds and subtle greys. The palette has a selection of finishes, including velvet mattes, gorgeous pearls and shimmering metallics. My favourite shades form the palette have to be Buzz, a metallic rose shimmer with micro-glitter, Nooner, a matte pinky-brown, and Mugshot, a metallic taupe shimmer. 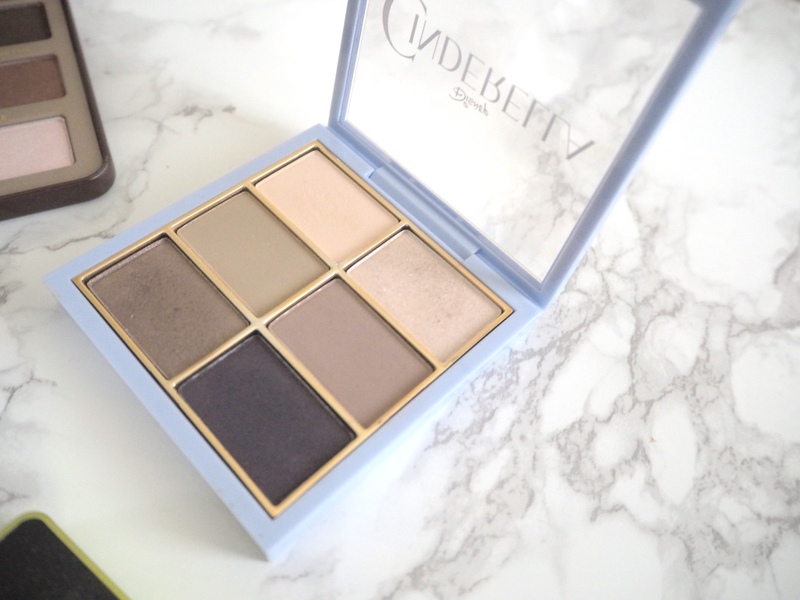 I absolutely love this palette and need to get my hands on the Naked Smoky soon! Elizabeth Arden - Blue Breeze Eyeshadow Quad | I was given this mini palette to me for christmas a couple of years ago and its always one I go back to using. The cute little quad includes a creamy white, a sky blue shade, an icy grey shade and a deep navy blue. This quad is great as its the perfect handbag size and includes a mirror for you to take out and about with you. 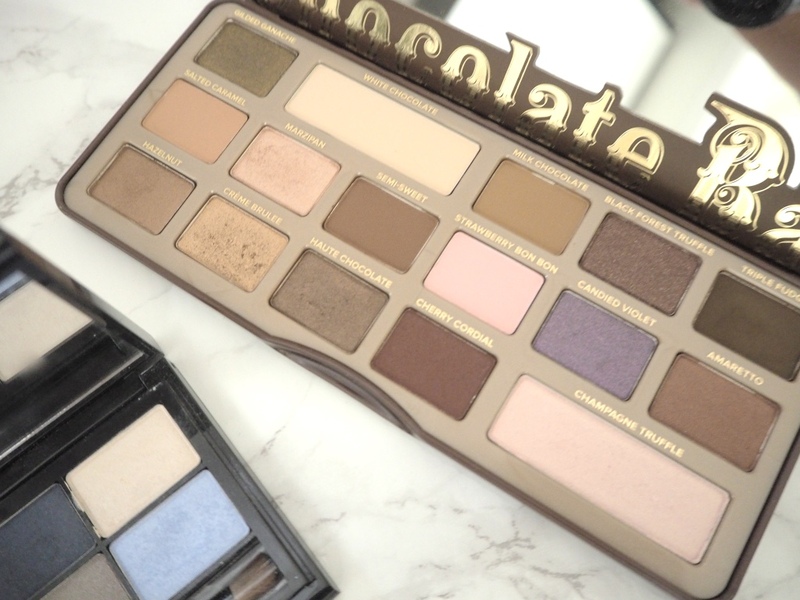 Too Faced - Chocolate Bar Eyeshadow Palette | I picked up this cute little palette in NY this summer after lusting over it for a while. I'm obsessed with the chocolate bar packaging and all the shadows are enriched with cocoa powder for that yummy chocolate smell. The palette has 16 matte and shimmer shades, ranging from soft caramel and golds to rich purple and browns. I love to use Marzipan as base and to enhance my eyes with Black Forrest Truffle - if I'm feeling adventurous i'll add some Candied Violet for that pop of vibrant purple. MAC - Cinderella Palette | I was one of the lucky ones to get my hands on this sell out, limited edition palette from MAC. For an everyday look this is the one I use as I store this one of my dressing table and most of my others have to be stored below it. 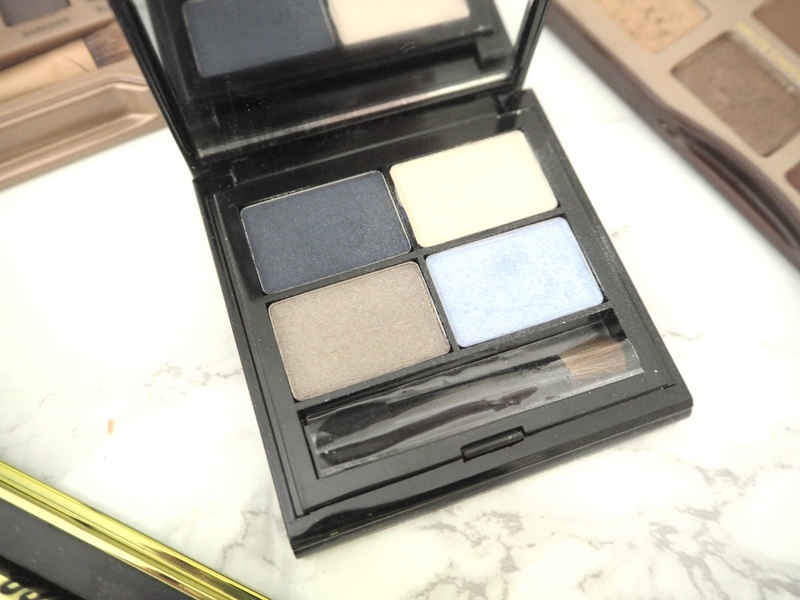 It has a selection of soft creams, taupes, mauves and then a deep midnight blue shade with added shimmer. Urban Decay - Vice 3 | I've actually blogged about this palette (review here) before but I just had to mention it again as its a firm favourite. 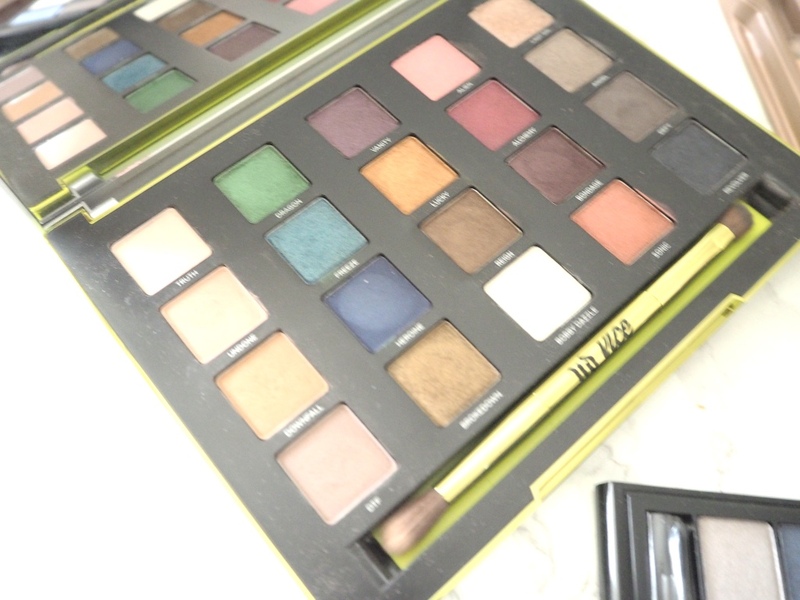 This is probably the most fun and quirky palette I own with a vibrant selection of shades. This is palette I will head for when i'm feeling a bit more adventurous and want a more intense look. It includes gorgeous greens and blues, vibrant reds and oranges and some deeper browns and blacks. I recently saw that they have launched the Vice 4, so thats next on my wishlist. 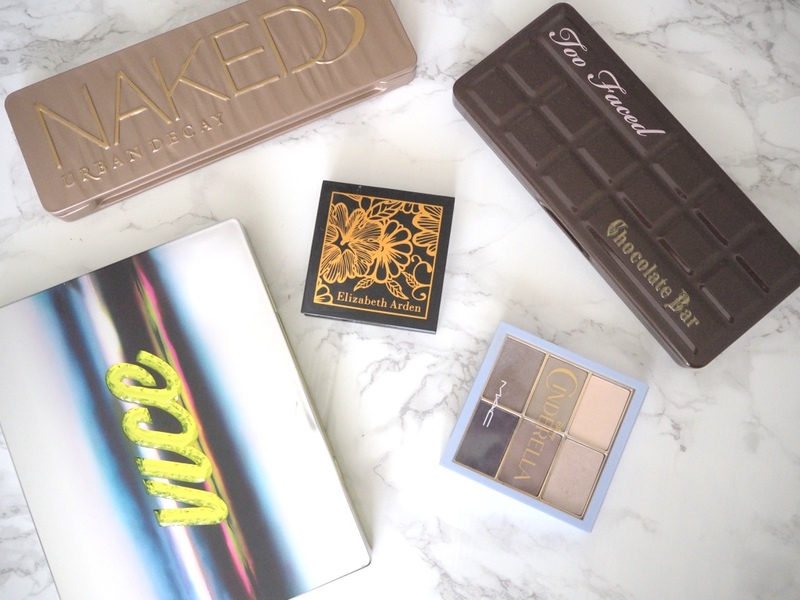 What are some of your favourite eyeshadow palettes?! Wow this post made me so happy! palettes are my fave! so much to play with in one product! I really wish I had picked up the Cinderella palette, it's so pretty!